I have a 2001 Toyota Camry 3.5, with about 120,000 miles. The check engine light came on and then a week later it became hard to pump gas. The pump stops every few seconds when pumping. I mentioned this to the mechanic where I get maintenance work done and he said it was a dealer issue. My question is what type of car repair shop would I take my car to other than the dealer. Most independent repair shops should be able to handle that issue if they do drive-ability. Call around and tell them you have an EVAP issue and it refuels slowly. 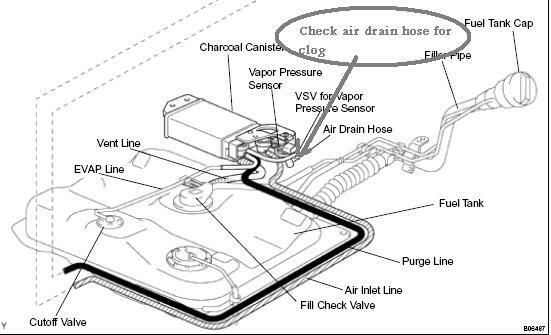 If you can get underneath the vehicle, check the air drain hose. Maybe something made a nest inside which is blocking the air flow.